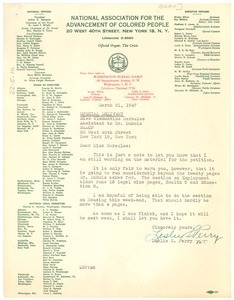 Washington (D.C.) - Noting that he is till working on his contribution to the NAACP's petition to the United Nations and regretting that it will run "considerably" beyond the 20 pages originally allotted by W. E. B. Du Bois; hoping to have it finished by that weekend, and to send it over soon thereafter. New York (N.Y.) - Noting that W. E. B. 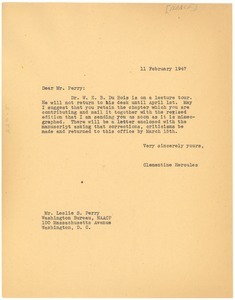 Du Bois is out of the office, on lecture tour, through April 1, and suggesting that he retains his contribution to the NAACP petition to the United Nations and mail it later, with the revised edition which "I am sending you as soon as it is mimeographed." New York (N.Y.) - On behalf of W. E. B. 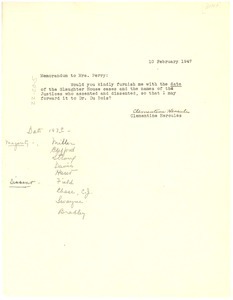 Du Bois, requesting he furnish the date of the Slaughter House cases and the names of the justices therein involved.